Ruby Calling now has a band page on Amazon.com which can be found here. The page allows us to have all our music in a single place. Reviews can be helpful to bands trying to share their music with the world. We’d love if you took the time to write one for us. It doesn’t even need to be very long! A few sentences and a star rating is great. Also – new music coming soon! If you like to manage your music through Amazon.com, you are in luck. Our debut EP, Ignite is available at Amazon.com. Just click on this link. Currently, our album doesn’t have any reviews. Would you click the link and post a review if you like our music? It will help other people find our music which is tricky. We are working on an Amazon band page right now and will share it with you when it is ready. Well, it happened! We are on iTunes now. The thing I like about iTunes is the potential for getting ratings. CALL TO ACTION: Can you go on iTunes and rate our EP? Now available on cdbaby. iTunes coming soon! 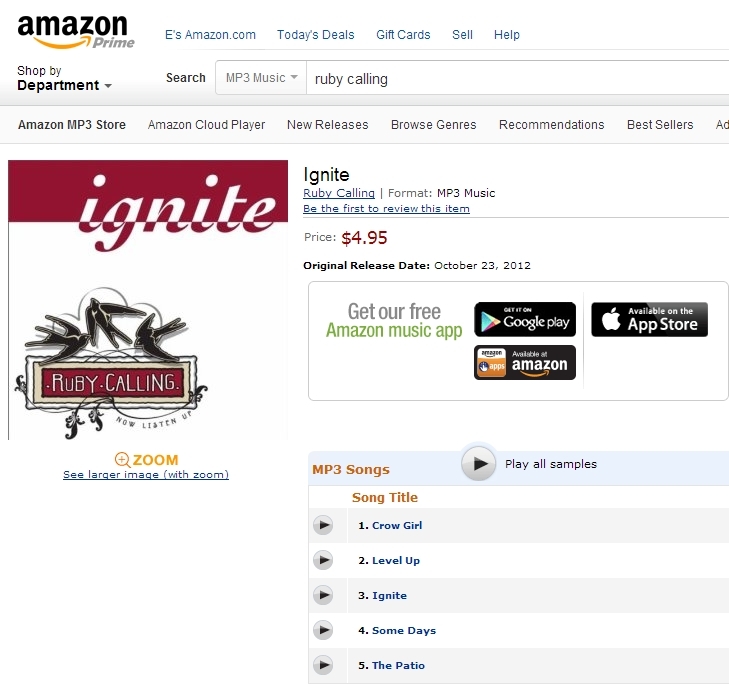 Our music is now available on cdbaby: http://www.cdbaby.com/cd/rubycalling. In addition, we can be found at http://rubycalling.bandcamp.com. Soon, our music will be available on iTunes. We will keep you posted! We did have a recording session yesterday at Nettleingham Audio in Vancouver, Washington. We recording a single song called the Enchantress of Numbers. The engineer recently graduated from recording school and our drummer had never before recorded so it was a day full of learning. All in all it was a good experience for everyone. Molly, the drummer, was a champ as was engineer Jay. We can’t wait to hear the results and we can’t wait to share them with you! Recording Enchantress of Numbers on Sunday! The band, in its new iteration, is going back to the studio on Sunday, May 19, 2013 to record the song about Ada Lovelace entitled Enchantress of Numbers. We are excited to be working with new recording Engineer, Jay at a studio in Vancouver, Washington. We will keep you posted on how things go. 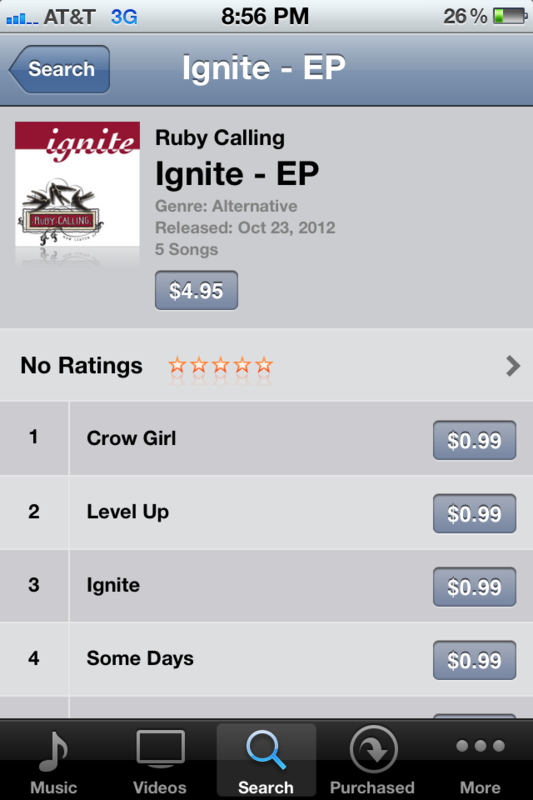 In the mean time, if you want to hear some Ruby Calling right now…go to rubycalling.bandcamp.com for a quick fix. I recently shared the new Ruby Calling EP with a great local radio station KZME. I guess they liked it because they played a song today! Yay! It is a dream come true to share our music with the world. Do you have your copy of our EP? If not go here: rubycalling.bandcamp.com. In other news, the band is working on a cover for Christmas for our friends at The Big Show. It is now stuck in our heads and we are contemplating busting out a video. Stay tuned. In this post I want to tell you about Ruby Calling’s second recording experience. To find out more about our first recording experience, go here. There was a lot of thrash about when we would record. I had originally wanted to record in the spring but our schedules didn’t align to make that happen. Honestly, I had a bit of a crisis. I felt like I was committed to recording but the rest of the band was not. In fact, I felt like I needed quit the band and start a new band of people who wanted to record! After an emotional heart to heart with my band mates, we decided to set a goal to record in the fall — together. We spent a lot of time honing the list of songs to record and practicing them and practicing them and practicing them. Jean and I had done some research on recording studios in Portland. We narrowed our list down to two which we visited. We liked both of them but the funky 70’s colors mixed with the high-tech vibe of Jackpot Recording Studios appealed to both of us. There were two recording engineers at Jackpot! : Larry Crane and Kendra Lynn. Having been a huge fan of TapeOp magazine and knowing that Larry Crane had recorded many of my favorite bands (Sleater-Kinney, The Gossip, The Decemberists), I was partial to him. One of my band members thought it would be cool to have a woman engineer. We decided to go with Kendra. Kendra was super responsive and very professional. We had not recorded in an official recording studio before and she was very patient with our questions. Our band fumbled around a little but Kendra never missed a beat. She got everything set up and ready to go. She told us what to do and expect. She guided us to record the very best takes. She was an absolute pro with the recording software and driven to find the best sound. She was very calm and made the entire recording session a pleasant experience. It was awesome. And then…she took our raw tracks and performed magic on them. Not that we don’t really sound that good [insert winky eye here]…but she took the best of the best and wove them into something…more. I am extremely pleased and proud of the results and happy that we went with Kendra. I am not going to lie though…recording was kind of brutal. Even after practicing the same thing over and over, I am not sure we were prepared to play it again and again with the added burden of being recorded. At one point I thought my fingers were going to fall off! (Who wrote that damn bass line..oh yeah…I did). And recording isn’t all playing and playing and playing. It is more playing and playing and sitting and waiting. It is exciting. And scary. And totally fulfilling. I loved it. My friend Mike, Ruby Calling’s official cinematographer, came and shot some photos and some video. I am curious to see what became of it…perhaps he is still working on it??? Mike??? After the recordings were agreed upon we had to get them mastered. Since we were adding in a song that wasn’t recorded with the rest, we needed to find someone who could take two different recording sessions and make them one seamless EP. We chose to go with Sky Onion and Gus was great to work with. He mastered the songs such that they flowed from one to another plus he helped us determine the order. I enjoyed working with him. So here is the end result: http://rubycalling.bandcamp.com/. We are a band of many, many songs. These songs represent but a sampling of our repertoire. I cannot wait to share the rest with you. In the past year, Ruby Calling had two very different recording experiences. The first was a “basement recording” of Crow Girl where an engineer came to our practice space (said basement) and recorded us. The drummer and the guitarist were in one room. The bassist (me), the bass amp and the guitar amp were in another room. This was our first experience playing in separate rooms. It was strange! We recorded the instruments with several takes of the song along with a scratch vocal*. Then, we recorded the vocals on top of the instruments with a big fancy microphone. It was a pretty low key experience for me and I enjoyed it. I especially liked singing while NOT playing an instrument. This was very freeing and made me feel like a true rock star. I was able to really focus on what I was doing. When I was playing bass I was totally focused on that and when I was singing I was totally focused on getting the best sound I could from my voice. After we finished recording, the engineer took the recordings home to mix them. We went back and forth a few times over email trying to get it just right. I am really pleased with the results which can be found on our EP. Take a listen here: http://rubycalling.bandcamp.com/track/crow-girl. * A scratch vocal is a “throw away” vocal that is recorded on an early take. It is piped into headphones and then the instruments play along with it. It helps keep the song timing and keeps vocals from bleeding into the other instruments during recording.